It may very well be one of the few virtues that has remained unaffected within us; even surviving our growing up years. When we were kids, there was nothing better than receiving a gift. It could be in any shape, form, wrapped, unwrapped, it did not matter. Just the idea of receiving that special something filled our heart with joy. Growing up, we eventually reach an age where even giving gifts becomes just as exciting as receiving. As a child, we used to get creative with our crayons, sketch-pens and drawing pad as we proceeded with illustrating our thoughts and wishes in form of a greeting card made personally for them. What spurred us to create something was the idea and the thought of the recipients’ happy faces while receiving it made us work extra hard to please them. Over time as we grew up, the idea of gifting evolved with us. We got even more creative and happier with the idea of giving and receiving gifts. There’s a strange sense of satisfaction in seeing people unwrap a gift and respond with unsullied wonder, amazement and happiness. That you have made them smile is worth far more than anything. Now, who doesn’t love getting creative with gifts? We live in an era where we strive to go that extra mile to bring the tiniest of smile on our loved ones’ faces. Creativity and gifting goes hands in glove. Undeniably, it is through gifting that we enrich both our own lives as well as the lives of others. On this note, Ruchita Bansal has launched Izhaar, a wedding and gifting lounge in Delhi. 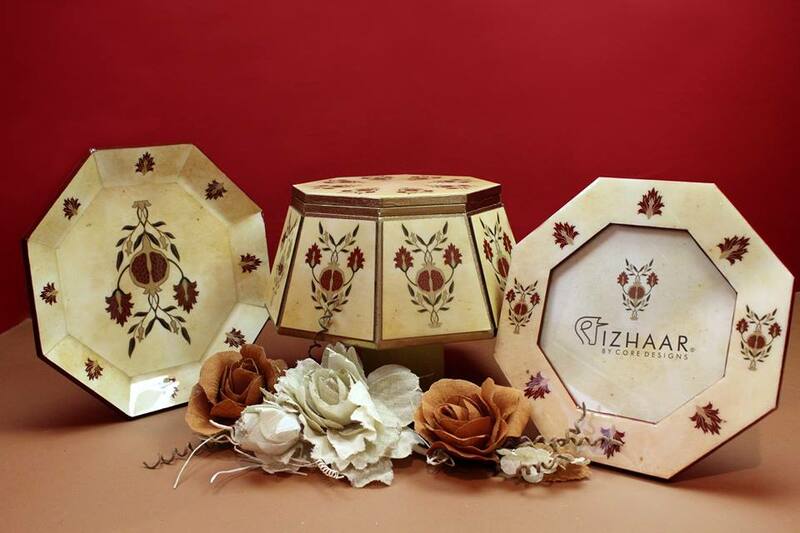 Izhaar is a brand of Core Designs specialising in bespoke luxury gifting and invitations. They create the most elegant, unique and stylish gifts, invitations and stationery to compliment your big day. They believe in delivering premium personalized services to preserve the beauty and magic of weddings. Founded by Ruchita Bansal, a creative entrepreneur, Izhaar’s design expressions take cue from each individual client and find expression with her relentless obsession with form, colour and above all originality. While most of her clients are awed by the spellbinding stories behind each creation, she finds greater satisfaction in the material and luxurious detailing that goes into creating each of these pieces. Ruchita has worked for some of the who’s who in the country, but she refrains from naming any of the Core Designs’ clients as a respect for her client’s privacy. While Ruchita is acutely aware of sustainability with each of her designs, she continuously challenges herself with newer material to give each design a luxurious and indulgent expression. As much detail goes into the sourcing of accompaniments such as sweets, chocolates, dry fruits, exotic fruits, as it does into making sure that the material used to put these accompaniments is reusable either as a decorative item or as a one of a king storage.